Welcome to Vietnam - a charming and energetic destination in South East Asia. Our 16-day tour along the country from North to South will definitely blow you away like entering a time warp: from modern and mixed cities Hanoi and Ho Chi Minh city, to the ancient architecture and ambience of Hoi An, and the royal life in peaceful Hue, from the busy floating Mighty Mekong Delta to the magnificent Halong Bay and ethnic Sapa. Full of unique interactions and experiences with friendly locals, with the picturesque scenery, surely, this Vietnam tour will delight all of your senses, with a price you won’t want to miss! After relaxation, our guide will take you walk to the theatre and you will enjoy Water Puppet Show – A traditional art performance of Vietnam. After that, you will enjoy a welcome dinner at local restaurant. Overnight in Hanoi. You will start with a visit to Ho Chi Minh Complex. Here you can visit the Ho Chi Minh Mausoleum where the corpse of Uncle Ho kept there. Next you will visit the Presidential Palace - a nice French architecture in the garden and Ho Chi Minh House on stilt. Visiting the house you will see the simple life of Ho Chi Minh - the president in Vietnamese's spirit forever. You will finish this area with One Pillar Pagoda - one of the most attractions in Hanoi you cannot miss with the special in architecture. Having lunch and you will continue to the Temple of Literature - The first University of Vietnam. The next destination will be Museum of Ethnology to learn more about Vietnam Culture. 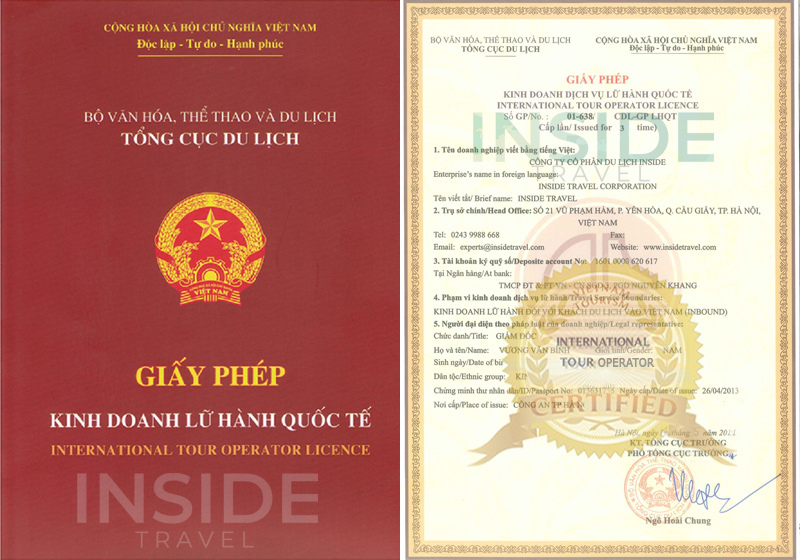 Next you will explore Hanoi by traveling through the Old Quarter with 36 ancient streets in a traditional cyclo. This slow - speed tour will give your great chance to fully enjoy the classic and modern of the capital. The tour will end at about 04.00 PM then it is your free time to go shopping, relax in Hanoi. 07:00 AM: After breakfast at your hotel, you will be picked up by your private car to head to Sapa via the Express Way. At about 12h00: Arriving in Sapa, have lunch at a local restaurant and go to your hotel to relax. At about 14h30: Meet your local guide in Sapa. Driver for a leisure trip. The drive uphill offers most spectacular scenery of Fansipan Mount. Just a kilometer out of the town, rose flower farms and later chayote grows on bamboo frames covered a vast area. We’ll stop at the magnificent Silver Waterfall before continue the road trip for some kilometers further to Heaven Gate and Tram Ton Pass. At 2047m above sea level, the Heaven Gate & Tram Ton Pass is the highest mountain pass in Vietnam. From here enjoy walking around for half an hour for beautiful scenery of both two side of Hoang Lien Son mountain range. The wind blows stronger to force the clouds moving constantly. It is the best point here to enjoy breathtaking scenery of the two side of Fansipan Mountain Range. Amazingly that the weather is very different by the side: In many days It is foggy and cloudy on Sa Pa side and sunny brightly the other side. Leaving the Heaven Gate for the way back downhill 7 km, then stop to pay visiting to some lush farm in O Quy Ho where different kind of vegetable, flower, fruit trees and even medicinal plants are grown for years which makes this part of Sapa ever green. Transfer back to Sapa and trip ends with drop off at hotel. 08h00AM: You will be greeted by the local tour guide who will give a brief introduction about the whole tour. After that, the trekking expedition starts. You will go off the main road, onto hilly mountainous trails. Your surrounding is filled with lush vegetation, pine forest and fresh air. You will experience the untouched beauty of the area. Ma Tra is the newly added location in a series of villages in Sapa that visitors can go to. The village is about 5km from the town of Sapa. This has around 50 households, resided by only H’Mong people. Ma Tra village has restored the traditional flax weaving loom, forging tools and carved silver production as part of tourism. After 3h walks from Matra, you will then reach Ta Phin village where the red Dao and H’mong reside. With this mix of ethnicity, the culture is this village is rather exciting and colorful. Lunch will be served on the way in a local family. You will also have a chance to visit the unique caves in the Taphin area. This cave system is small and meandering, leading to all different direction but will eventually lead you to one point. The village also has an old monastery built during the French colonial period. There is also an arts and crafts house displaying and selling authentic jewelries made by the locals. In late afternoon, you will take your car back to the town. In the afternoon (time will be flexible and changed as requested), your driver and guide come to your hotel and pick you up to transfer back to Hanoi. 08.00 AM: The driver will pick you up at the hotel, departing 3.5 hours to Halong Bay – the World Natural Heritage recognized by UNESCO twice. Upon arrival, embark the cruise and enjoy welcome drink while having tour briefing. A sumptuous lunch will be served on board while the ship sailing further to the Bay, make your time to admire its dramatic limestone islands. You can rest at your leisure on the sundeck or relax in your cabin. In the afternoon, you will have time to swim in the warm and calm water or get on kayaks of your choice. Kayaking is very easy for all levels and ages to do. Our expert and experienced guide surely instruct you basic paddling steps before leading you to explore the extraordinary beauty of Halong Bay. After 01 hour exploring the bay, you will get back to the cruise for relaxation before attending Cooking class in the late afternoon. You will continue our journey on Halong Bay in the early morning. A Tai Chi Class on the sun deck is a must that you should not miss when on a cruise. After breakfast, you will explore Sung Sot cave - one of the finest and widest grottoes of Halong Bay. Next, keep cruising and passing the fishing village with its unique way of life. You leave the boat around 12:00 at noon, you go ashore and transfer back to Hanoi. About 04.30 PM, you will arrive at your hotel in the Old Quarter. Our private car will wait for you at the hotel, transfer you directly to the airport for your flight to Hue. When arriving in Hue, you will be welcomed and transferred to the hotel by our tour guide and driver. Stay overnight in Hue. 08.30 AM: Our tour guide will wait for you at the hotel lobby to start the tour around Hue Old Citadel. Welcome to Ho Chi Minh city, the most bustle and hustle city in the south of Vietnam. This is one of the must-visit first cities attracting international tourists. At Tan Son Nhat Airport, the guide and driver will welcome then take you to your hotel to do check-in. After relaxation, it is your free time to discover the city, walk around Ben Thanh market or taste very delicious local cuisine. Overnight in Ho Chi Minh City. After the lunch in the local restaurant, in the afternoon, you will have a city tour including the Reunification Hall, formerly known as the Presidential Palace. It was towards this modern building that Communist tanks rolled on the morning of April 30, 1975, as Saigon fell. This fascinating building is filled with history still fresh in the minds of many locals. The tour also includes the War Remnants Museum, the Old Post Office, Chinatown and Ben Thanh Market – the central market for the city and one of the liveliest areas. 07.30 AM: After breakfast, your guide will take you to the trip to Cai Be pier ( 86km ) from HCMC by car / van via Trung Luong Freeway. The program will start with a visit of Cai Be floating market. Then, the rowing boat will take you deeper into the countryside on smaller canals to enjoy the peaceful time. Back to our boat to go across one of the longest river in the world, Mekong River, to come to An Bình Island. Travel on a handmade canal to Ut Trinh home & have an optional lunch. After lunch, we can walk around this orchard & enjoy some cups of tea when listening to the traditional music in the ancient house. Walk in the local village to visit the local workshop to see how to make rice paper, coconut candy, pop-rice... Enjoy some sweets with a cup of hot tea. Optional biking can be made for a leisure! It will be so amazing to bike on village paths to see the local daily life: orchard, school, church, pagoda, traditional houses and maybe the ancestral ways to pick up fruits in Mekong Delta... Visit the brick kilns where you can see how the local people create beautiful potteries from clay. The cruise will end at Vinh Long city! Meet the car for trip to Can Tho. Overnight in Can Tho. About 05.30 AM: In the very early morning, your guide will take you to Cai Rang floating market where locals go to buy and sell a variety of fruits vegetables from boats of all sizes and which is the most original ones and bustling places of the region. If you have experienced many exciting days when traveling to Vietnam, surely you get out of bed early one day to witness this lovely local market to fulfill your Vietnam Holiday. The boat trip will give you valuable chance to observe the unique "advertisement" of local business - "Cây Bẹo": Sellers tie their goods to a tall pole so that buyers can see from a distance what they are selling. Seat on local trading boat, witness boasting activities in market, find out local life in stilt house along river. Come back to your hotel for breakfast and relaxing. At a scheduled time, transfer back to Ho Chi Minh city. On the way you will visit Vinh Trang pagoda - a combination of Asian and European pagoda. Lunch on your way at a local restaurant. Free time at your leisure, sightseeing, shopping, buy souvenirs, and take photos until be transferred to the airport for your onward flight (03 hours prior to your flight time). Thank you and see you again!